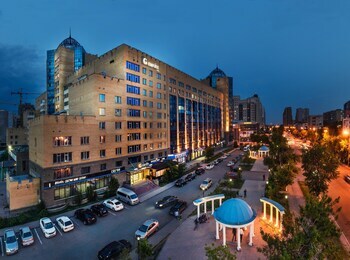 With a stay at G Empire in Astana, you'll be 3.4 mi (5.5 km) from Singing Fountain and 3.8 mi (6 km) from Bayterek Tower. Featured amenities include a 24-hour business center, express check-in, and express check-out. Planning an event in Astana? This hotel has 2691 square feet (250 square meters) of space consisting of a conference center and meeting rooms. For a surcharge, guests may use a roundtrip airport shuttle (available 24 hours) and a train station pick-up service.